My kids love it when a dessert recipe takes a few tries to get right. Between this recipe for caramel pudding parfaits and the one for pumpkin spice latte creme brûlée two weeks ago, my kids have been in dessert test tasting heaven. Each recipe took 3 rounds to get just right. There were no complaints though. The original recipe for the caramel pudding was good but it called for so many pans and bowls. In a multi-component dessert such as this, you expect the amount of dishes to be higher than average but 4 bowls/pans for the pudding alone was enough to make me look for a different pudding recipe. There was also the fact that the original recipe used 5 egg yolks leaving me with more egg whites than I knew what to do with. Maybe one day I’ll learn to make macarons but, in the mean time, I wanted a caramel pudding that didn’t use just egg yolks. I ended up finding a recipe that used no eggs and was just as creamy and delicious as the original recipe. Win-win. Making caramel can seem intimidating if you have never made it before but with a little practice, it is pretty easy to master. The most important step in making caramel is cooking the sugar. It’s important to keep a close watch over the sugar as it cooks because there is a fine line between when the sugar becomes caramel (good) and the sugar becomes burnt (bad, very bad). Although some caramel recipes call for using a candy thermometer to determine when the sugar has cooked long enough, I think it works better to determine when the sugar is ready by checking the color. When you first cook the sugar it will be clear, then it will slowly turn a pale yellow, then golden, then light amber and then deep amber. As soon as it turns deep amber, it’s ready. It’s also important to use the right size pan for the job. When you add the milk or cream to the caramelized sugar, the mixture will bubble up A LOT and you want to make sure there’s enough room for that to happen. You also don’t want to add all the milk or cream at once which will almost guarantee a molten lava flow of hot sugar over your countertops. The milk or cream should be added gradually so it can be slowly whisked into the caramel rather than boiling over the pan. When the milk or cream is added to the hot caramel, a lot of heat and steam rises from the pan. This part used to scare me until I figured out I could wear an oven mitt to protect my hands as I was whisking and the problem was solved. I promise the process of making caramel is really not as scary as all my warnings make it sound. And look at what you get as a reward for your efforts. Mix cookie crumbs, butter, and salt in a medium bowl until butter is evenly distributed and mixture looks like wet sand. Press about 2 tablespoons of the cookie mixture onto the bottom of eight (8-ounce) mason jars or ramekins. In a small bowl, whisk 1/2 cup of the milk with the cornstarch, vanilla and salt until smooth. Set aside. In a large saucepan, combine the sugar with the water and bring to a boil. Cook over moderately high heat, undisturbed, until the sugar mixture turns a deep amber color, about 8 minutes. Remove from heat. Very gradually whisk in the remaining 3 1/2 cups of milk, 1/4 cup at a time. The mixture will bubble up when you first add the milk but will settle as you whisk it. Whisk the pudding over moderate heat until the caramel has dissolved into the milk. Bring mixture to a simmer. Cook the pudding over moderately low heat, gently whisking occasionally, until the mixture thickens slightly and deepens in color, about 10 minutes. Remove from heat. Stir the cornstarch mixture again in case it has separated. Gradually whisk the cornstarch mixture into the pudding mixture. Cook the pudding over moderate heat, stirring, until the pudding is very thick, about 1 minute. Pour the pudding into prepared jars (about 1/2 cup per jar). Refrigerate until the pudding is set, 4-5 hours. Stir sugar, corn syrup, and water in a deep medium saucepan over low heat. Increase heat to medium; cover pan and cook 4 minutes. Uncover; increase heat to moderately high. Let the sugar mixture boil, undisturbed, until it turns golden brown to deep amber in color, about 6 minutes. Remove from heat. Slowly whisk in cream, 1/4 cup at a time. The mixture will bubble up when you first add the cream but will settle as you whisk it. Whisk in butter and salt. Cool completely. Whip cream with sugar until soft peaks form. Set aside. Remove pudding jars from the refrigerator. Spoon 2 tablespoons caramel sauce into each jar. Top with whipped cream and sprinkle with cookie crumbs. To neatly fill the jars with pudding, I used a small funnel and a 1/4 cup measuring cup. Recipe adapted from Bon Appétit Sept 2011. Caramel pudding recipe adapted from Food and Wine via Smitten Kitchen. 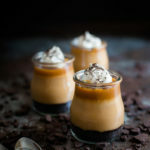 These caramel pudding parfaits look so yummy! I can imagine how happy your kids must have been with tasting! I bet they were hoping for some more tries! 🙂 Love your photos! Thanks, Julia! When I make desserts for the blog, my kids like to mess with me and tell me how the recipe can be improved just so I’ll go through another round of testing. I definitely have no shortage of taste testers here!